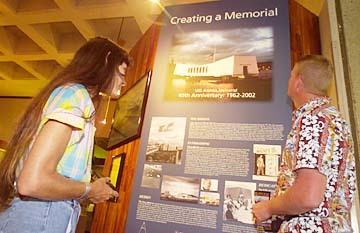 Jackie and James Woodby looked at a new exhibit Saturday detailing how the Arizona Memorial was created. The exhibit was dedicated yesterday. James Woodby is stationed at Wheeler Army Air Field. When the USS Arizona Memorial was dedicated 40 years ago, some critics said it looked like a squashed milk carton, said Jan Peter Preis, son of the memorial's designer. The late Alfred Preis was upset and outraged at the time, but he understood that it would take time for people to appreciate it, his son said. Alfred Preis knew as he designed the memorial "that it was the best contribution architecturally he could make to society, to America, to Hawaii," said Jan Peter Preis, a Honolulu architect. However, designing a memorial in rural territorial Hawaii, Alfred Preis probably did not anticipate how significant the memorial would eventually become. "I don't think that he imagined that Hawaii would become as prominent as it is now and that people would visit Hawaii as they are now," his son said. Last night, the USS Arizona Memorial Visitor Center Museum unveiled a new exhibit that details the history of the memorial's creation, from the initial idea of building a shrine to the sunken battleship in 1946 to its dedication on Memorial Day in 1962. Jan Peter Preis talked about how his father maintained his faith in and devotion to his new country despite wartime fears and prejudices. Born in Austria, Alfred Preis fled Nazi Germany in 1939. In coming to Hawaii, "he thought he had fled all wars," his son said. "He came to the most peaceful place in the world." Then came Dec. 7, 1941, when Japan bombed Pearl Harbor and the United States entered World War II. Soon after, Alfred Preis and his wife were taken to Sand Island, where they were interned for three months with other Europeans from Germany and countries that had been attacked or annexed by Germany. "People just came to their home and arrested them," Jan Peter Preis said. His father spent those three months sharing stories with the other internees, teaching them calisthenics and trying to keep everyone in good spirits. Through it all, "he believed in the good of the country," Jan Peter Preis said. "He understood that he was considered the enemy, and he understood why he was put there. He never had any resentment because of it, or I never felt it." To his father, he said, "the memorial was a dedication to everything that America stands for: peace and freedom and prosperity." Last night's fund-raiser also honored the USS Arizona Memorial Fund's newly appointed trustee, ABC News anchor Sam Donaldson. He and H. Delano Roosevelt hosted the event as part of a three-year, $10 million capital campaign that will create a new museum at the national park. Daniel Martinez, the USS Arizona Memorial historian, said space restrictions and the outdoor venue prevent the visitor center from displaying more than 5 percent of the artifacts that have been donated -- uniforms, scrapbooks, diaries and other personal mementos. Sometimes the exhibits are a summation of a soldier's life, such as a collection that includes one man's high school picture and diploma, a photograph of his wife, his last letter home, the telegram announcing his death and the Purple Heart he never received, Martinez said. Others include a clock that stopped at 8:06 a.m., the moment the ship exploded, he said. "We have to be prepared to showcase these things," he said. For more information about the USS Arizona Memorial Fund, visit www.pearlharbormemorial.com.